Worried about interest rate changes and how they might impact on the level of repayments on your mortgage? If so, then our Mortgage Risk Model can help you identify how interest rate changes might impact you. Some online mortgage calculators will allow you to see how a change in interest rates would impact the level of repayments, that’s only useful to a point. For example you might discover that a 1% rise in interest rates would increase your monthly repayments from £500 a month to £560 a month. 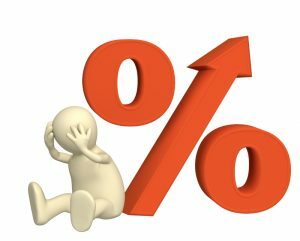 However how likely is a 1% rise in interest rates? Our mortgage risk model answers exactly that question! You can use our online tool to estimate how your mortgage repayments might change in the future based upon changes in interest rates. Our model uses the latest market data (read more here) to run 1,000 simulations of future interest rates over the next 30 years. These interest rate simulations are then combined with your mortgage information to show you how your repayments might look in the future. To help make sense of these future simulations we present the results in terms of the likelihood of seeing monthly repayments of a given amount. The above figures are quoted based on the interest rates you entered in the boxes above and would ordinarily represent current levels of interest rates. However we all know that interest rates change over time and the simluator below estimates what your repayments might be into the future. Click the button below to run the simulator. The graphs below show the results of running 1,000 simulations of future interest rates. These 1,000 scenarios are then collected together to understand “the spread” of possible future repayments for your mortgage. Look over the graphs and table and then read the explanation of the results below. The results above show how the repayments on your mortgage “might” change over time. On the x-axis (the one going across) it shows the years into the future from today. The y-axis (the one going up the page) shows the monthly repayment amount. The graph shows five lines, coloured from purple, green, orange, red and blue. What do the lines represent? REALLY BAD (Purple). There is only a 1/20 chance that repayments would be at this level or HIGHER. Out of the 1000 future scenarios considered only 50 produced repayments higher than this. PRETTY BAD (Green). There is only a 6/20 chance that repayments would be at this level or HIGHER. Out of the 1000 future scenarios considered only 300 produced repayments higher than this. AVERAGE (Orange). This represents the average result. 500 of the scenarios produced higher repayments than this and the other 500 produced lower repayments. PRETTY GOOD (Red). There is a 6/20 chance that repayments would be at this level or LOWER. Out of the 1000 future scenarios considered only 300 produced repayments lower than this. REALLY GOOD (Blue). There is a 1/20 chance that repayments would be at this level or LOWER. Out of the 1000 future scenarios considered only 50 produced repayments lower than this. Nobody knows with certainty what the level of interest rates will be in the future. However we can look to see what returns are available on government bonds over different future time periods which lets us know what “the market” is implying about interest rates into the future. The simulation above is based upon the current market’s expectations of interest rates in the future. A graph showing the interest rates implied by the market in government bonds (gilts) is shown below. Broadly speaking the pattern of future repayments will echo those changes in the expectations of future interest rates. If you change your mortgage at some point in the future then you may be able to secure a better deal, reducing your monthly repayments. This model is based on TODAY’s expectations of future interest rates. TOMORROW’s expectations will be different.